You love eating at Seattle's sublime restaurants, but where should you head to pick up fresh seafood to cook at home? Although the following markets certainly aren’t the only places in town to find quality fish, these are our very favorite places to buy seafood—from the store, from the farmers’ market stall and from the boat. 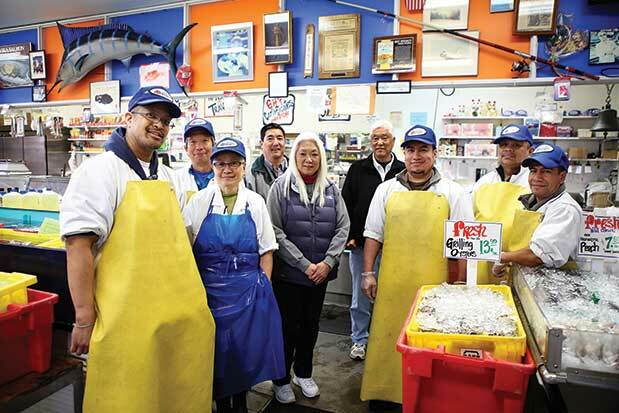 > Compared to the bustle of Pike Place Market, this family-run (by three generations of the Yoshimura clan) fish market seems downright subdued. Whole rockfish, branzino and mackerel stare up at you with bright, jelly-like eyes—a sure sign of their freshness. Overwhelmed by the options? You can’t go wrong with their famous house-marinated kasu black cod. Early Monday mornings—even in peak summer months—is the time to shop quietly at Pike Place Market. And even then, there’s a cacophony that surrounds Pike Place Fish Market (86 Pike Place; 206.682.7181; pikeplacefish.com). There, orange-clad fishmongers shout orders and toss fish, impervious to the many flashing phone cameras snapping pics of this quintessential Seattle experience. A short walk away, Pure Food Fish Market (1511 Pike Place; 206.622.5765; freshseafood.com) appears smaller, brighter and punctuated by giant lobster tails and pink crabs to lure in shoppers. City Fish Co. (1535 Pike Place; 206.682.9329; cityfish.com) is smaller still—although it’s the longest-established fish place in the market. Here, you’ll want to get a cup of crab cocktail to enjoy while perusing the fare. Across the cobblestones at Jack’s Fish Spot (1514 Pike Place; 206.467.0514; jacksfishspot.com), it’s equal parts fish market—look for live clams, mussels and oysters, plus salmon galore—and seafood grill, best known for fried fare (fish and chips), cioppino and the ultrafresh Quilcene oysters from Hood Canal. > Before Taylor Shellfish had developed a reputation for its swanky oyster bars, it was first a farm—a Shelton farm known for being the U.S.’s biggest producer of farmed shellfish. A day trip north on Chuckanut Drive will take you to the Samish retail store, where you can buy oysters, smoked salmon, geoduck and more to take with you, or for a picnic overlooking the farms. The original Seattle store, on Capitol Hill, is the only one of its local oyster bars to also offer retail. > If you’ve spent any amount of time wandering Seattle’s major farmers’ markets, you’ve probably seen—and tasted—some of Loki’s legendary local salmon. You’ve probably even met Dylan Knutson, who meets and greets loyal customers while his father, Pete, and brother, Jonah, are out on the water, fishing for wild salmon and halibut in southeast Alaska and on Puget Sound. > Although H Mart and Seafood City both boast impressive varieties, this Japanese chain wins our vote for supermarket seafood selection—plus all the accoutrements you’ll need to complete your meal. Besides offering the oysters, squid and geoduck, it is also one of the few places that carry sushi-grade tuna and other fish. Go back to the main Seafood Guide article.